During this beautiful couple's wedding reception at the Royal Palm in Harvey, Louisiana (on the westbank of New Orleans), we slipped away for a few minutes to get some photographs of the couple around the venue. 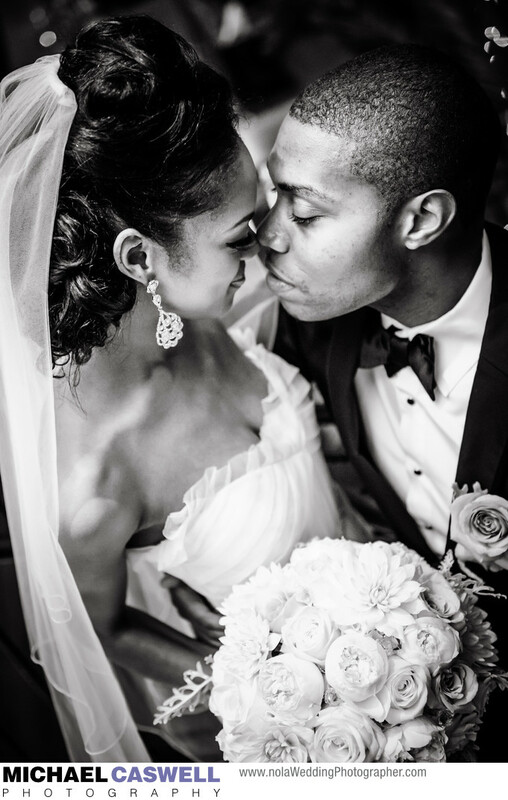 This tightly-framed black and white shot was taken on the stairs leading up to the reception space, and wonderfully captured this romantic moment between the newly married bride and groom. Couples are often reluctant to miss any of the reception for portraits, but the time period while the guests are eating is a great opportunity to get these shots without missing out on much of the party and with minimal stress. Location: 1901 Manhattan Blvd, Harvey, LA 70058.